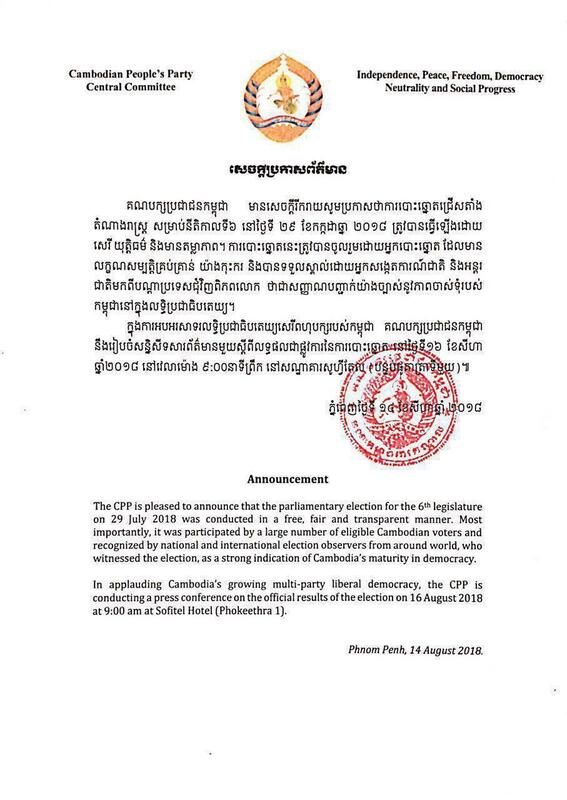 Phnom Penh (FN), August 14 - Cambodian People's Party will hold a press conference on official election result, according to the announcement dated on Tuesday. "In applauding Cambodia's growing multiparty liberal democracy, the CPP is conducting a press conference on the official election result on 16 August 2018 at 9:00 A.M, Sofitel Hotel," CPP wrote in the announcement. The preliminary result announced by the National Election Committee (NEC) on 11 August 2018 after multiple verifications indicated that voter turnout in the 6th mandate National Assembly members election 2018 has increased from 82.89% to 83.02%, an equivalent to 6,956,900 voters among the 8,380,217 registered voters. Cambodian People's Party (CPP) received 4,889,113 ballots; FUNCINPEC Party received 374,510; League for Democracy Party received 309,364; Khmer Will Party 212,869; and Cambodian Youth Party 39,333.